Chart Plotter combines 800 UK Admiralty Charts into a single zoomable view. As you zoom in and out and scroll around Chart Plotter will load the most detailed charts to cover the area you are looking at. Working with charts becomes easy. You will all ways be looking at the most appropriate chart. Connect a GPS to your computer and see your current position and track on the chart. Chart plotter can track your position on the chart, panning and zooming in and out automatically to show your position on the most detailed chart available for your location. AIS support is included as standard. Connect an AIS receiver and see the positions of ships overlayed on the chart. Or look at the tabular AIS screen to see details such as speed, direction, range, ship name and more. An electronic logbook makes it easy to keep an accurate log of your trips. Log entries with position and speed can be added automatically at set intervals from your GPS. Just right click on the chart to enter your own waypoints. See useful information such as distance to waypoint. In an emergency you can add a Man Over Board waypoint with a single click. This is added at the current position from the GPS and an onscreen display appears that helps you get back to that position. Simplify passage planning with routes. 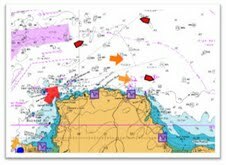 Add a route to show where you intent to go and Chart Plotter will calculate everything you need to know for your passage. Distances, bearings between all of the points are available at a glance. Hook up your GPS and Chart Plotter will help you travel along your route, it will show your progress along the route and tell you bearing and distance to the next point. Draw areas on the chart to show areas of interest. Found an area with lots of fish? Then draw it on the chart. At anchor? then draw an area of deep water around your boat and then set an alarm on it. If you were to then drift outside the area the alarm would sound. Draw bearing and distance lines on the chart to help with passage planning. See at a glance the distance and bearing between two points.